Maximum size: 24 mm (extrapolated from shell length). 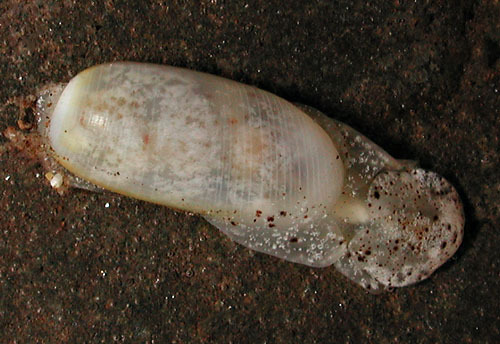 Identification: This species has a transparent to translucent-white, cylindrical shell. Spiral striae are confined to the apex and base when young but develop over the entire shell in older individuals. (Note 1) The animal is translucent-gray variably flecked with white and spotted with brown. It may be distinguished from Liloa curta by the absence of spiral striae in the center of the shell when young and the slenderer, more opaque shell with more irregular spiral striae when mature. Natural history: Liloa porcellana is a moderately rare species found in open sand and Halimeda kanaloana beds at depths of 8-29 m (26-95 ft). Dredged shells at the Bishop Museum extend the depth range to at least 311 m (1020 ft). The number of shells found in sand samples suggests that it's more common in deeper water. It is a nocturnal species that buries itself in sand during the day and lays a white, spherical egg mass. Distribution: Big Island, Maui, Oahu and French Frigate Shoals. Probably widely distributed in the Indo-Pacific. Taxonomic notes: Many Hawaiian shells at the Bishop Museum labeled Atys curta are actually this species as are many shells from elsewhere in the Pacific labeled Atys parallela (Gould, 1847). The descriptions and illustrations of Haminoea tomaculum in Pilsbry, 1917/1921 and Edmondson, 1946 may refer to this species rather than to Liloa curta. In that case, it was probably first reported from Hawaii in Pilsbry, 1917. It's illustrated in Severns, 2000 as Cylichna pusilla. Photo: CP: 12 mm: Black Rock, Maui; June 6, 2012. Note 1: Rarely, shells are found in sand samples that are inflated apically rather than cylindrical. Other characteristics (that cannot be explained as part of that distortion) seem to match the shells of this species and we have seen an example in which the shell appeared to have suddenly "inflated" during the course of growth. Also, the degree of inflation is highly variable. Therefore, we're treating them as atypical examples of Liloa porcellana (perhaps due to injury, disease or parasitism?) rather than as a separate species. (see photo).